00:40:00 Makes 4 servings, 1/4 recipe (414 g) each. Makes 4 servings, 1/4 recipe (414 g) each. Bet you didn’t know you could make a quick Thai green curry sauce out of PHILADELPHIA cream cheese! Just add some green curry paste and coconut milk and you’ve got a simmering sauce for pork, peppers and snow peas. 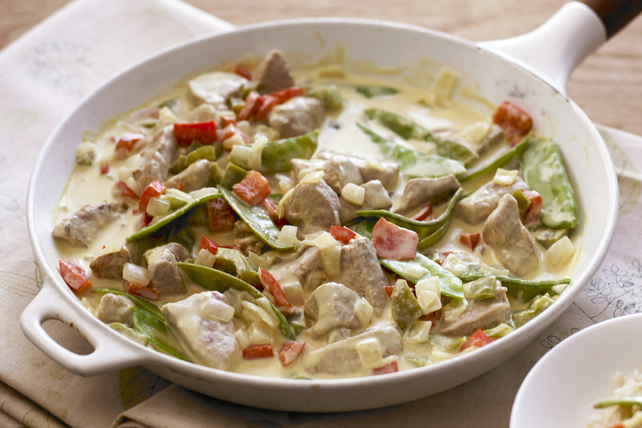 This Curried Thai Pork recipe is a restaurant favourite you can easily make at home! Cook and stir meat in large skillet sprayed with cooking spray on medium-high heat 4 min. or until evenly browned. Add peppers and onions; cook 4 to 6 min. or until crisp-tender, stirring constantly. Add next 4 ingredients; cook 3 min. or until cream cheese product is melted, stirring constantly. Bring just to boil; simmer on medium-low heat 8 min. or until meat is done, stirring frequently. Add snow peas; cook and stir 2 min. Serve over rice; top with cilantro. Top with 1/4 cup toasted shredded coconut just before serving. Help your friends and family eat right with this tasty meal that's prepared with better-for-you products. As a bonus, the colourful red peppers provide an excellent source of vitamin C.
Serving Size Makes 4 servings, 1/4 recipe (414 g) each.